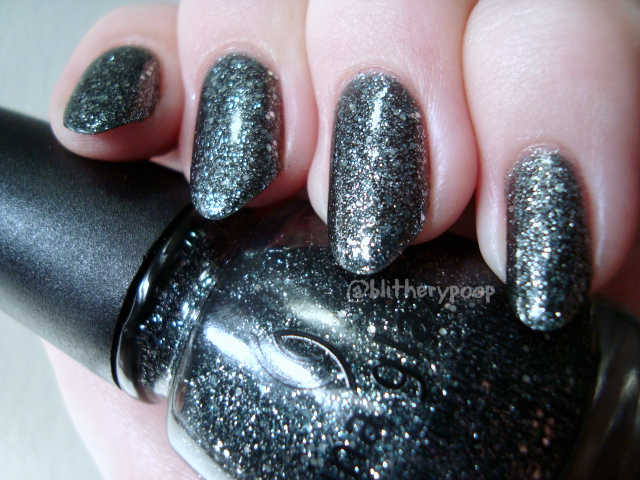 China Glaze Tinsel Town has silver glitter and microglitter in a black jelly base. So sparkly!! Ahhh! Tinsel Town isn't that old, by Throwback Thursday standards. It's from China Glaze's 2011 Let It Snow collection. Back then I'd never even heard of China Glaze, as weird as that seems. I bought Tinsel Town last year, on eBay. Really glad I did too, because I love it! China Glaze should have something with microglitter in every collection they ever do. It's what they're best at. This is three coats, since the base is sheer. How ready are you for the impending holidays? My tree isn't up yet, but I have bought a few gifts. The Christmas season doesn't start at my house until after my birthday on the 5th, haha. We don't have any decorations out or anything yet. That's happening this weekend. I love that polish, blacks and dark grays and gunmetals and even silvers are some of my favorite colors to wear in winter and fall.